Do cats need an FVRCP vaccination? They might put up a fight, but those vaccinations could save your feline friend's life. It's a routine vaccination administered to countless cats and kittens every year. The FVRCP shot fights three feline viruses: rhinotracheitis, calicivirus and panleukopenia. The vaccination is named after the viruses: "FVR" for feline viral rhinotracheitis; "C" for calicivirus infection and "P" for panleukopenia (distemper). Knowing more about these illnesses, and the threats they present to your cat, will illustrate why cats need protection from them. Here's why the FVRCP shot is so important to your cat's health. What are rhinotracheitis, calicivirus, and panleukopenia? Rhinotracheitis, caused by the feline herpes virus, is a common virus that invades the nose lining, sinuses, throat, windpipe and eye membranes. Signs include sneezing, nasal discharge, drooling, fever, lethargy and a noticeable loss of appetite. The cat may also squint, with mucous discharging from his eyes. If the cat develops a herpes ulcer in his eyes, he'll need intensive treatment, including intravenous fluids and possible forced feeding to prevent death from dehydration and starvation. Calicivirus is a common respiratory infection that affects the cat's throat, eyes, nasal passages, mouth, and sometimes lungs, intestines and musculoskeletal system. Symptoms include runny eyes, sneezing, nasal discharge, fever, drooling, and ulcers on the tongue or palate. Severe cases can cause pneumonia. Kittens and older cats are at greater risk of death from calicivirus than healthy adult felines. Panleukopenia, also called feline distemper, is a highly contagious virus affecting blood cells in the intestinal tract, bone marrow, brain, and developing fetuses. Most commonly seen in kittens between four and six months, panleukopenia can strike any unvaccinated cat. Symptoms include fever, lethargy, lack of appetite and vomiting. Diarrhea, either bloody or mucous-like, combines with vomiting to cause severe dehydration, and a cat can die within 12 hours of onset. Rhinotracheitis is most common in cats with weakened immune systems, or those with physical or emotional stress. Cats in shelters often get rhinotracheitis, stressed by overcrowding, but genetically, purebred and longhaired cats are more predisposed. They get it from infected cats that sneeze or cough around their environments or from humans who don't wash their hands between handling cats. Calicivirus is also most often seen in shelters, as well as in catteries and multi-cat homes. Poorly ventilated households are conducive to calicivirus. Lack of vaccination or lowered immunity puts a cat at risk, and while cats of any age are susceptible, young kittens are most vulnerable. The onset of calicivirus is sudden, and because it is so contagious, if one cat gets it, all cats in the home or shelter are likely to contract it. Panleukopenia is widespread and potentially fatal. Nearly every cat, indoor or outside, comes in contact with it, through the secretions of other animals or from people who handle infected cats. Unvaccinated cats are most vulnerable, and kittens are especially threatened because their immune systems are undeveloped. Vets usually recommend that cats get annual FVRCP booster shots, but some believe vaccination once every three years is sufficient. All kittens should receive their first shots at age six to eight weeks, because very young kittens are especially vulnerable to panleukopenia and calicivirus. Their first shot should be followed by three booster shots, each three to four weeks apart, until the kitten is 12 weeks old. Adult cats whose vaccination history is unknown, should receive an initial FVRCP shot, followed by a booster three to four weeks later. Pregnant cats should never be vaccinated, as the live virus may affect her unborn kittens. All cats, even indoor felines who never go outdoors or interact with other cats, should still receive FVRCP shots. These diseases are airborne, so every cat needs to be vaccinated against them. The initial shots, administered to kittens, help them develop immunity. Annual FVRCP booster shots, usually given with feline leukemia (FeLv) and rabies boosters, help the cat's immune system remain ready to respond to a disease. If the indoor cat is the only feline in your home, is never boarded at a kennel, does not go outside or have any contact with other cats, including those of your friends, your vet may determine that boosters every two to three years will keep the cat healthy. Because FVRCP is a live virus, in rare cases, cats may contract the diseases the vaccine fights. Breathing difficulties, a high fever or excessive vomiting are signs to call the vet immediately. 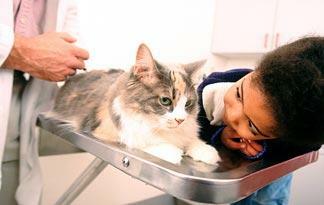 More commonly, after an FVRCP shot, a cat will feel soreness in the area of the injection, and may seem depressed. He'll perk up once the soreness fades. He may have a runny nose, develop an oral or nasal sore, or throw up for the day after receiving the shot, but then he should have no further complications.